Your playing is so powerful. Where does that energy come from? What inspires you? I don’t know. Many players have this energy, they just manifest it differently. I think Charlie Parker and Coltrane had that same energy. Also Michael Brecker, Steve Grossman, Bunky Green, these other people I really like, they also have that sort of energy you say. I think it’s where it comes from. What do you picture in your mind while improvising? I don’t think I picture anything, I’m just trying to react to what’s happening around me. Trying to be in the moment and listen the best I can, not only to the people around me but also to myself, and then try to build something as an improviser that has compositional weight, fortitude, strength, and cohesion. Agrima, Indo-Pak Colatition's second album, was self produced and is only available as a digital download and vinyl. Why did you produce it yourself and why the option of not including CD? Not many people are listening to CDs, I mean, there’s an older crowd that enjoys having a CD but… you know, I’ve been teaching at Princeton, I direct the jazz program there, and I don’t think any of my students has a CD player. The only time I seemed to get a CD is when somebody sends me one. Even the latest models of cars don’t have CD players, so, you know, I don’t want to say it’s a dated model but it didn’t really seem worthwhile. As far as self producing goes, the vinyl is just a beautiful package, it’s a double LP with a gatefold, and a lot of thought went into it. It’s a nice thing that you would want to have in your home. I would rather have those in my garage than two thousand CDs. And we’re selling download cards also. I have these two skinny boxes, each with about sixteen inches long, that hold two thousand download cards. Besides that, it was a kind of an experiment too. What happens if you don’t release a CD? Are people still going to buy it? Your usage of electronic effects to manipulate the sound of your saxophone is a novelty here. How do you feel about it? It’s funny because a lot of people think this was my first time with electronics, but I did an album called Samdhi, back in 2011, that was actually really heavy with the electronics and audio processing. So, this is definitely not my first time with electronics, but it’s something I really want to get back to. In this particular setting and instrumentation with Indo-Pak Coalition, it really helps feel the sound, and because we go for a more rock aesthetic with this project, I think it has come to that as well, sonically. What are the qualities you most admire in your trio mates, Rez Abbasi and Dan Weiss? I don’t even know where to start… They are both incredibly versatile and very well listened. They have unique personalities, both virtuosic musicians with great flexibility. We have a certain share of knowledge but we approach that knowledge differently. We can talk about this music as jazz musicians or we can talk about it as people who know a good bit of classical music at the same time. We can see the music from very different perspectives at once, which it’s very unique and I’m very grateful for that. What would you change in the current jazz scene if you had the power to do it? What I would change, and it would solve a lot of problems, is… I would hope that musicians value what they do a lot more and respect themselves a lot more. I think there’s a certain amount of desperation and we end up selling ourselves very cheaply. We don’t approach what we do as a business or as a product, so we’re willing to bend over backwards for a little compensation, and that’s not only bad for us, as individuals, but it’s bad for the whole scene. If everybody says: I’m not going to do a gig for less than $500, the minute that someone chooses to do a gig for less than $500 they’re ruining the business for everybody. There’s a lack of unity and a lack of self-respect. Your blend of contemporary jazz and Indian music is very unique. Who are your main influences in both currents? My influences kind of span the world. 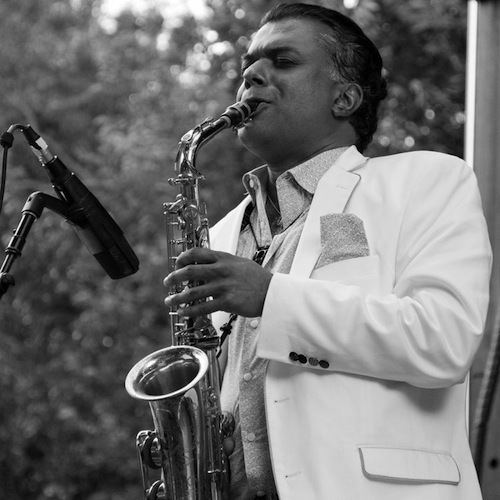 There’s an Indian singer called Parveen Sultana who has been very influential for me; of course, Kadri Gopalnath, the saxophonist, has been an important figure for me, and there’s a great percussionist called Trichy Sankaran. There’s a bunch of folks that are incredibly inspiring, but those three in particular have been really moving. Besides, there’s other non-Western music. There’s West African music I really like, Ugandan, some Albanian folk music, there’s some Korean drumming that I think it’s very fascinating. And then jazz-wise, it’s really the masters! You know… Charlie Parker, Coltrane… Contemporarily, Dan (Weiss) and Rez (Abbasi) are really inspiring to me, Steve Coleman was a very early influence, and Steve Lehman, who’s one of my best friends. What was the first jazz record you fell in love with? Can you name two persons whom you've never collaborated with but you'd like to? Let me think… I feel like it changes over the years, but I would love to play with Herbie Hancock for sure. Maybe spend a week with him. And I’ve always hoped that I would play with John McLaughlin, and it never happened. I would love to do that. If not a musician, what would you have been? A mathematician, or probably a number theorist or a topologist. What can we expect in 2018? Any new project in mind? I’m hoping that Indo-Pak Coalition does a bunch of touring since we haven’t done anything since the album came out. So, that’s kind of my main focus. And then there’s talk of doing a live trio record with bass and drums, but I’m still trying to figure out who that’s gonna to be. That will probably be my next project. I never actually did a live album, so that’s something I’m really looking forward to.